Never miss an important date by checking our Calendar of Events frequently or by subscribing to our email list. Learn more about Hunter-Wolff Gallery Opening Receptions, annual events and important announcements. 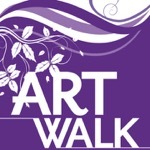 Join us for First Friday ArtWalk. Meet our featured Sculptor and Artist of the Month Cassandra Sharon. This event features new work and signature pieces created by Casssandra Sharon. Always free and family friendly. Is spring your favorite season? Then mark your calendar to visit Old Colorado City's art district on Saturday, May 11 where you leave winter behind. Inhale the fresh blossoms, where the trees are hanging a little lower with the weight of tender leaves and flowers. Rejoice in the season on this day when more than a dozen art galleries gather to celebrate the month of May and it's top-performing artists outside on the Avenue. Enjoy spring's beauty, learn about art and refresh your soul. Old Colorado City In Bloom is where you can be soothed and restored, and have your senses put in order. 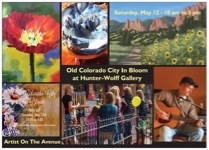 Experience Old Colorado City in Bloom with Hunter-Wolff Gallery featuring landscape painter George Bodde and dozens of galleries, shops and restaurants on the Avenue. 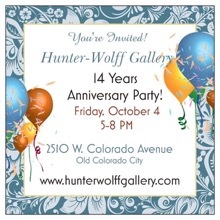 Hunter-Wolff Gallery has a great afternoon planned just for you. Don't miss this special Saturday-only spring event. Meet amazing artists, learn from live demonstrations, and enjoy special activities, good food and fun! Mark your calendar now! Join us for this special Opening Reception featuring Marlene Kort and June 7 First Friday ArtWalk. 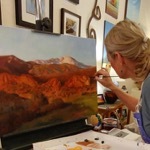 Meet our featured Artist of the Month Colorado Springs oil painter Marlene Kort . This event is a "Meet and Greet" the artist and showcases Marlene's inspirational collection.Marlene's fine art oil collection is an exclusive Hunter-Wolff Gallery exhibit and features a themed series of thoughts, visions, or feelings that are engaging and meaningful. Marlene captures those moments in time that shape ones cherished aspirations, often imagined or desired and life transforming while invoking positive feelings.Free and family friendly. 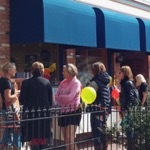 Join us for First Friday ArtWalk. Enjoy Hunter-Wolff Gallery and meet featured artist from Texas, Tom LaRock, on this evening along with special demonstrations. This event is free and family friendly. 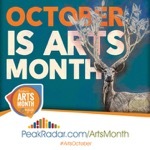 This October, the Pikes Peak region is celebrating Arts Month, an annual initiative to raise awareness for the quality, diversity and value of the arts in our community. Building on the popularity of National Arts & Humanities Month, our local initiative is being orchestrated by the Cultural Office of the Pikes Peak Region. The official call to action during Arts Month is to “have at least one new cultural experience with family or friends during the month of October.” We look forward to seeing you for your cultural experience! 5-8 pm 14 Year Anniversary Show, featuring Colorado Artist Jennifer Jung and her finest collection of serene landscapes inspired by some of Colorado's hottest destinations as well as some of Jennifer's favorite hiking spots. Explore all of the best of the best regional artists at Hunter-Wolff Gallery. Join us for an evening of celebration with refreshments. Naughty or Nice? It doesn't matter at Hunter-Wolff Gallery. We are rolling out the red carpet in recognition of all the incredibly gifted artists who have dedicated a life-time to creating art and if you participate in our Toy Drive to benefit Colorado Springs new Children's Hospital, you are automatically off the Naughty List. Bring a soft stuffed toy to ArtWalk or anytime between 11/01/19 and 12/10/19. Cash donations accepted too for the benefit of the children at CS Children's Hospital. Happy Holidays! Do the "Christmas Stroll" in Old Colorado City from 5 pm to 8 pm while gathering gift ideas and shopping for the holidays. Enjoy all the special merchant treats and holiday festivities! VIsit Hunter-Wolff Gallery from 9 am to 8 pm! Two Days, Once A Year on Saturday, January 25 and Sunday, January 26 from 10:00 am 5:00 pm find original art at Hunter-Wolff Gallery at lower than normal prices. 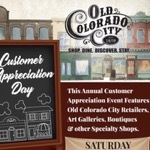 Join Old Colorado City's art district and its dozen plus art galleries and other retail shops for a big day featuring top notch art work for big savings. Adding to, or starting your art collection is even more attainable at this Annual "Customer Appreciation Days" buying event. Enthusiastic crowds of art buyers are expected at this two-day only event. 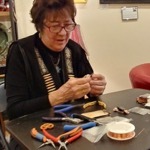 As a bonus, you will meet featured artists and see live demonstrations. Arrive early for the very best selections. On this weekend only, from 10 am to 5 pm. Pottery Sale for Big Savings! 10:00 AM to 6:00 PM featuring Tony Heslop seconds pottery and work by select gallery artists. Come Early! One day only. Bring boxes and cash! Mark your calendar for this special event celebrating 45 years of one of Colorado Springs preeminent potters Tony Heslop. Join us for Tony's reception Friday, November 22 from 6-9 pm. Tony will be celebrating his 45 year career as a local artist and to commemorate this special time, he is delivering 250 one of a kind clay pieces. You also get a second chance to meet Tony and select one of his commemorative pieces on Saturday, November 23 from 11 am to 6 pm. First come first served.